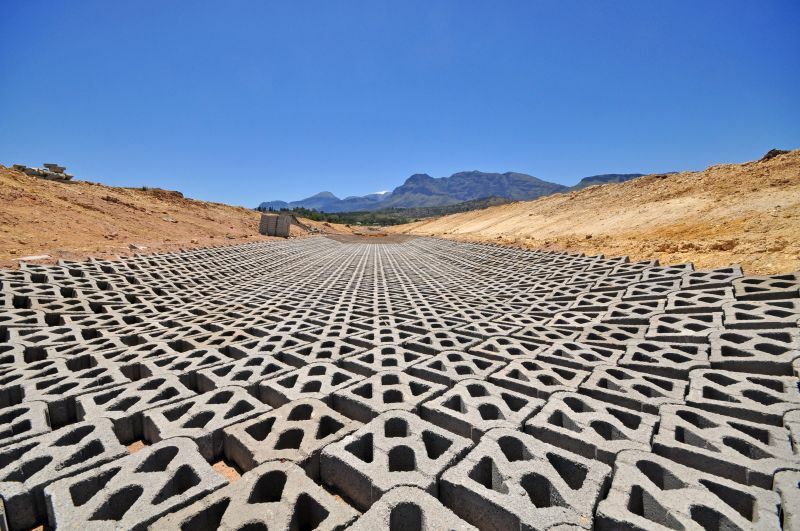 To protect the planned Vlakkeland low-cost housing estate from potential flooding, a 6,5m wide section of a 1,8km stormwater drainage channel has been lined with over 79 000 precast concrete Terracrete grass blocks, manufactured by Terraforce licensee, Klapmuts Concrete. 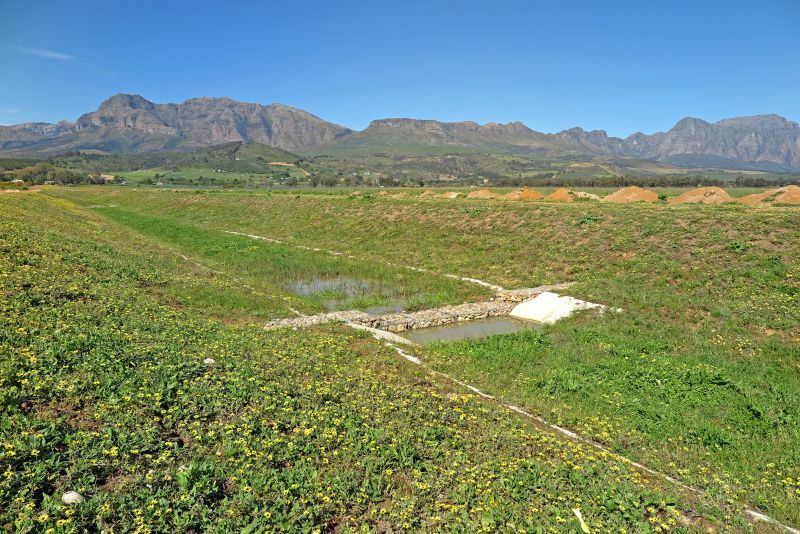 The channel forms part of a sustainable urban drainage system (SUDS) designed to ensure that stormwater flows are managed and dispensed in a controlled manner next to the planned development on the outskirts of Paarl in the Western Cape. The unlined section of the main channel was designed to accommodate a 1:100-year flood (50,2m³/s), whereas the lined section can accommodate a 1:5-year flood (18m³/s). The deployment of the Terracrete blocks and mini gabion dams, which were built into the downstream section of channel one, reduces flow rates and allows the SUDS system to better filtrate any runoff. Another major component of the system is a large attenuation pond, as well as a secondary and smaller attenuation pond. An on-site survey was conducted to identify the locally indigenous vegetation naturally occurring on site, and surrounding areas and species were carefully selected for rehabilitation. The main channel is composed of four material layers: The sub-soil, which was compacted with rollers to 93% MOD AASHTO; a layer of Grade A2 geofabric, which prevents the blocks from settling too much and allows filtration while preventing the washout of locally sourced bedding sand (20-30mm); and the Terracrete grass blocks. The Terracrete blocks were filled with a bio-charcoal material and mushroom spores, the former to absorb pollutants in the water and the latter to recharge the charcoal and keep it fit for purpose. Specific plants were chosen for their water purification properties, as the stormwater from this channel ultimately ends in the Berg River. The channel banks above the blocks are being planted with grass. Over 79 000 precast concrete Terracrete grass blocks line a 6,5m wide section of a 1,8km stormwater drainage channel next to what will become the Vlakkeland low-cost housing estate.